When I shared that I buy a year’s supply of honey at one time, many of you wondered if it crystallized and if so, what I did to solve that. Yes, my honey does crystallize, but it’s very easy to fix that issue. By the way, have you ever read the words “do not microwave” on the side of your Honey Bear? That really means, “DO NOT MICROWAVE”. Many a Honey Bear has quickly become a sticky, melted mess within just a few seconds of being in the microwave. In fact, I believe you’d even be able to hear your Honey Bear moan, “I’m mellllttttiiiiiinnnggg….” as he turns into a plastic honey pool. Bless his little heart. Instead, I put my container of crystallized honey into with a few inches of water and heat it on the stove. If your honey is raw and you’d like to keep it that way, you want to heat the water very slowly and at low heat. It will eventually dissolve the honey. The following picture is a little bit blurry – that would be because my Honey Bear is in a steamy sauna, and the steam fogged up my camera lens. A little post update – myhnymybb makes a great point in her comment about not heating anything in plastic. I totally know that – and yet I did it anyway, then took a picture of it. Perhaps this is one of those “Duh Moments” I was talking about. I don’t want plastic leaching chemicals into my honey, which is why I usually store and heat my honey in glass jars. I just so happened to have a honey bear with crystallized honey, so I grabbed it and took a picture for this post. But yeah, plastic isn’t great, especially when it’s heated. So don’t follow my example. Put your honey into glass if possible. But I still say don’t use a microwave to melt down the honey, no matter if it’s in glass or in a honey bear. How do you store your honey? Do you buy bulk amounts of honey? Have you ever melted a Honey Bear in the microwave? I have a great local source for raw honey that has it year round. So, I buy it half a gallon at a time. That typically lasts me anywhere from 2-3 months depending hon how much I bake. Although, the last batch I bought only lasted me 4 weeks! Loved your solution for crystallized honey..I was about to throw alot of it away. Just wondered…once it’s in the glass jars, how do you PREVENT it from crystallizing? Is it from air or cold? Neither. it crystallizes because it isn’t moving. Honey only really crystallizes if it doesn’t move fora while. The movement prevents crystals from forming. Hope this answers your question. I have been a honey user for several years. My Grandpa is a bee charmer, or that is what I always called him. LOVE HONEY! Honey keeps better in a glass jar. When microwaved, it loses over half (don’t remember the percentage and my grandpa is 74 and sleeping at this hour so I can’t call him) of it’s desease fighting properties. Think of honey as a bunch of little golden soldiers fighting off those crummy little nasties in your body. Microwaving kills those little golden soldiers. I am 30 now and have never forgot this analogy but it works so well to explain the benefits of honey. Love this sweet golden gooey liquid. Yum. Remember though, all things in moderation. Guess I forgot to really answer your questions. I store mine in a glass jar. I dip with a wooded old fashioned honey comb dipper. In a pinch, I bought the little honey bear at the big box store one time. My husband microwaved it, to my horror, and the little bear lost his face. I get honey in bulk also. I use it for tea, coffee, baking, in butter, in and on my food (some of it) and have also used it on scrapes and cuts. Honey heals just as well as antibiotic oinment if not better. When I was a teen, I dabbed raw honey on my face for a zit zapper. Works like a charm. Honey is a wonderful gift from God and the bees. Should the lid remained secured on jar? Store all honey in GLASS jars, heat on stove or in Micro to dissolve. Do not heat the plastic containers, including the cute little bear, because heating the plastic releases BPA;s into your honey, which you will be putting into your body, or those of your loved ones! Even if the plastic says it is BPA free. all plastic is made from chemicals of some kid, do you really want to give melted chemicals to your children? Thank you! I have some crystallized honey in my cupboard…and have been wondering what I do about it. Awesome. I eat it crystallized with peanut butter on toast. Feel free to delete this comment without ok’ing it, but I want to ask a question. I don’t buy honey in the same quantities as you but I do buy it on sale and so usually end up with several plastic bottles (no honey bears in the UK that I’ve seen). When my homey crystallizes I put hot water from the faucet in to a jug or bowl and pop the honey bottle into it for a few minutes which solves the problem. Guess I shouldn’t be doing that with the plastic bottle – oops. My father has been a bee keeper as long as I can remember and now my husband keeps bees as well!! We store our honey in several sizes of wide mouth canning jars, for ease of use. We usually have a bulk supply on hand and with crystallized honey I heat a pot of water, remove from heat, then add the honey jar and cover with a lid- sort of like a steam bath spa treatment for our liquid gold ;) This keeps the honey from direct heat and preserves more of the beneficial enzymes. And yes…I have melted a honey bear or three in the microwave in my time but thankfully I’ve learned a thing or two about microwaves since the 80’s and now… I know better, so I do better!! My dad raised bees when I was growing up and we love honey. I think there is more reasons than a melted honey bear not to use the microwave. You need to heat the honey low and slow. Overheating damages the honey. The microwave heats it hot and fast which changes the honey too much. You really want to simmer on really low heat the honey jar in a pan of water for 20-30 minutes. And if you store honey in plastic it picks up the taste of the plastic, so if you do not use the honey in the honey bear quickly it will pick up the taste of plastic and change the taste of the honey. My kids LOVE peanut butter & honey sandwiches & Crystallized honey is wonderful for making sandwiches. I just take my knife and smear it on the bread as is :) Don’t want to waste a bit of my local honey – it has done what modern medicine couldn’t do for my youngest daughter’s allergies! Great tip! I knew to heat it, but I didnt know about heating it on the stove in plastic was still bad. Now I’m going to veer off just a smidge. I was looking for honey one day at Earth Fare and they had honey in a glass jar. It was white and solid. Another lady and I stared in fascination. Neither of us had a clue how to use something like that. Any help? Thanks! This white, solid honey was more than likely creamed honey. Creamed honey is a wonderful, no drip solution to the sticky sweet mess so many people have a problem with. It is crystallized, just like the honey you’ve probably forgotten about in your cabinet at some point, but the sugar crystals in this honey are super small, so instead of a gritty, chunky mess, you end up with a velvety, whipped texture that spreads easily with a butter knife. The best part about this honey? You can buy a small jar as a starter, and add it to store bought honey so that when it crystalizes, it just forms more creamed honey for no extra cost! What about grabbing a spoon and eating it right from the jar? :) That’s my preferred method of dealing with crystallized honey! I’d say just don’t buy honey if it is stored in a plastic container or transfer it to glass as soon as you get it home. I’m currently using the last of the honey from my dad’s honeybees. It was harvested more than 10 years ago and it has not crystallized yet and I’m guessing that is due to the fact that it was stored in a sealed glass jar. PLEASE write an article about why you don’t like to microwave things. I just keep hearing it is bad, but no specifics. Until I can find out why it is so bad, it is awfully hard to give up the convenience of melting butter, reheating leftovers, etc. Thanks! Why would it be white?? Did she melt the honeycomb in with it?? I’ve never heard of white solid honey. sorry that was supposed to go on another post! Thank you VERY much! I will check that out. I just discovered Dr. Mercola’s web site and it is awesome! There are differing opinions on Dr Mercola’s credibility. In the interest of fairness, please don’t delete my post again. I’m happy to post all opinions, but I glanced at the email address you used (only seen by me) and recognized it as a fake, so I quickly deleted, assuming the comment was spam. I have quite a few comments to moderate each day (many of which are spam with email addresses similar the one you used), so this was the result of a quick look so I could move on to other work. In the winter, we usually keep the honey (in a glass jar of course) on the back of the stove. If that isn’t enough to keep it from crystallizing, I’ll set it right next to the crockpot (which is almost always on in the winter). 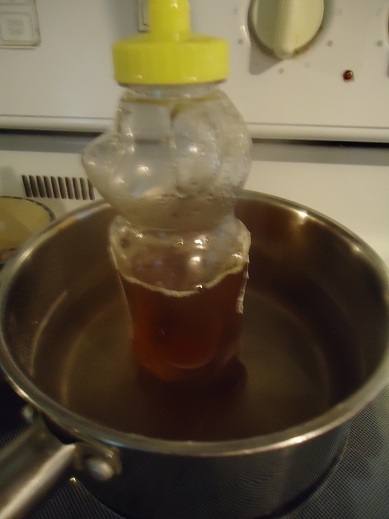 Back when we used a microwave, I melted a poor defenseless Honey Bear. Thankfully I caught it before the honey started leaking out into the turntable, but he was a sorry little shrunken fellow with questionable honey. Now that I’m a slight bit more educated about the effects of micro-waves on the chemical bonds in our food, we no longer use the microwave. But it’s in the basement for guests who must microwave something. We missed it at first, but it was an easy adjustment! And food REALLY tastes much better cooked and reheated God’s way… Hmmm, just maybe HE knows something?! And yes, I realize this thread is two and a half years old, I just wanted to share. I’m a beekeeper in Eastern NC, and we store bulk honey in food grade plastic. I’d love to find glass containers large enough to store it in, but we harvest a hundred pounds of honey at a time, so that’s simply not feasible. Anyway, we sell honey in pint jars, glass of course, and use a quart jar for our home use. FYI, nearly all honey crystallizes over time. This is a function of the properties of the nectar and pollen the bees use to make honey. (There are one or two types of honey that don’t crystallize, but they aren’t common depending on where your live. Tupelo honey, common in FL and places where there are lots of swamps/Tupelo trees, is one variety that doesn’t crystallize. Anyway, other folks have offered the proper way to reheat honey– low heat, double broiler, NEVER in plastic– so I don’t have to rehash that. I would offer that some folks prefer crystallized honey– it’s called “creamed” honey. However, heat IS required when making it for sale, so I don’t recommend purchasing it for health benefits. Heat does kill the healthy enzymes, so when reheating crystallized honey, don’t try and rush the process by turning up the heat! Some varieties of honey crystallizes faster than others, so if yours turns after a month or so, that’s perfectly fine. :-) Hope this helps! It is probably raw honey. I had never seen it before either, but I ordered some from Tropical Traditions and it is really different. I also use sage honey and it does not crystalize. I must respectfully disagree, Charlotte. Raw honey is honey that has not been heated, pasteurized, or altered in any way. I buy mine by the gallon and store it in wide-mouth pint jars. I set a canning lid on and seal it with my vacuum sealer. Has anyone found a glass honey dispenser that they like? No, and I’ve searched and searched for one with a little opening thingy in the side of the lid for the honey scoop thingy. I’ve looked at antique stores, online and nothing really looked that good tome. I gave up. My son was able to cut out a little “hole” for my honey dipper from the side of one of those plastic Ball lids that go on the jars. It doesn’t really screw on anymore, but it does fit rather well and allows me to use the dipper with the half pint jar. I guess honey pots are a thing of the past?? I keep my honey on the top of my fridge. It’s warm enough that it keeps it from crystalizing so I don’t have to worry about it. It’s not warm enough if your honey is already cyrstalized though. I learned from my local produce family owned store that if you store honey right at 75 degrees and in a dark place it won’t crystallize for a long time. I tried it without knowing that fact and it worked. I stored a large white bucket of honey under my stairs where there isn’t a lot of temp fluctuation but it’s not necessariy cool and after a whole year that honey was not crystallized. I too have my honey in the plastic bear and I just run it under hot water to get rid of the crystalization. Oh yes, I have murdered a honey bear with the microwave. I tend to use my microwave to destroy household items, start fires, make charcoal, and occasionally make a mess which leaks through the bottom of the microwave vent onto my just cleaned stove. When reheating (Raspberry honey that has crystallized) from the local farmers market in a water bath in a pot on the stove are there any safety concerns (botulisim, etc.) that I need to be aware of or can I just heat the little glass jar up again and snack away and then keep it at a cool room temperature. The jars of honey that are white are “creamed”, the one I bought was very good and said “raw” from a group of nuns in Northern California, the honey is their cottage industry. I appreciate the comments here, had just realized the “bears” probably contain BPA and was looking for confirmation. The last time I burned my hand from picking up a hot pot I smeared honey on the burn and pain went away quickly and healed quickly. Thank you for the advice for the crystallized honey. Didn’t feel like going to the store. I personally like microwaves, not to cook in but to reheat coffee mostly. what I have is a large plastic container of sue bee honey, it dried out,I tried putting it in the pan of hot water it started to melt the jar, so I was thinking of using an old salad/soup bowl placing it upside down in the pan and setting the plastic jar on it that way the jug may not get melted,during the thinning process,good idea to store the honey in a glass canning jar I will do that next time. I buy locally sourced honey only for health benefits (it has REALLY honestly helped with allergies), and it usually comes in glass jars, which allows for microwaving, but I Never allow it to get really hot, because that only increases the crystallization further the next time. I had two plastic bottles of years-old honey that had totally crystallized and turned dark brown, so after reading this page I dumped both of them out into a small saucepan. I put it on very low heat, and kept stirring constantly until the crystals all dissolved. I am waiting for it to cool before I pour it back into the plastic bottles, and if I can find some glass jar, I’ll use that. One thing, though… the honey did not return to its original clear, golden color. It’s still dark brown, although all the crystals are gone. What color was yours when you began this process? Was it also dark brown? Or was it still golden, but just had crystals? We’re beekeepers, so we keep our honey in quart jars and the 5 gallon buckets we use to strain the honey. We’ve also been known to store it in the comb on the frames if out bottling buckets are full. I’m not a “Pro” but i do believe that honey helps with environmental allergies. I have a spoonful of honey everyday, but not for allergies, i do it to keep colds and flu away… also if I bet a cut from say tending to my chickens, i slap some honey on it before the bandage, it’s a natural antibiotic. Local raw honey helps prevent allergy symptoms because, in theory, the bees that have made the honey have pollinated plants and flowers local to the area. So when you are consuming pollinated honey from a local plant source, and it creates a natural defense against allergy symptoms. I am not a doctor, so I can’t claim to know if this is 100% accurate! but I give a little honey to my kids during allergy season and it seems to help. Usually a teaspoonful a day, either straight or mixed in with warm rooibus tea. I usually cut the honey in half compared to the sugar called for in a recipe. I really enjoyed reading all the comments and benefits of honey. I was looking for an answer why honey crystalizes and found the answer!!. I am a new honey user and now wonder why I waited so long to use this wonderful nectar. I have bought 2 different kinds of honey from Azure. They come in a plastic gallon size jug. I bought Mint & Wildflower. Both have been very thick & almost creamy like. You have to spread it with a knife. It doesn’t pour. Anyone know why? I am guessing that they are raw honey…which if that is the case that is just how raw honey is. It isn’t quite the amber color like we buy at the store in those cute bear containers. :) Mine is always a cream color and very thick. I buy 1/2 gal sizes of honey from Costo . I saw the honey had cristolized so I took it outside in the sun. Shazaam. It is almost back to clear. Tastes great. I put it on shreded wheat every morning. It’s great . Now a days it is very difficult to find pure and natural honey. My wife and I use honey in coffee. It tastes so much better than sugar of any kind. We bought two plus gallons from a bee keeper in Northern Saskatchewan when visiting family there. He produces vast quantities for commercial purposes. It’s some of the same honey you find in the plastic bears. He poured ours from a stainless steel holding tank in his bee barn into plastic ice cream buckets. He told us that we could freeze the honey and later allow it to thaw before use. If it crystallizes place the container in hot water until it liquefies.